That's what Robert Allen says. We say this collection is easy to live with and fits into many decorating themes. Large scales for a sofa or textures for accent, this fabric group is furniture and decorating friendly! Inspired by the rich, complex green found in the soft velvety growth of an ancient forest, Moss is an evocative hue with classic appeal. Consider it forest green’s ultra cool cousin. Part of the Enchanted Color collection, Moss creates a moody, tonal vibe when mixed with deep colors like cocoa brown and slate gray or serves as a calming counterpoint to exuberant hues like tangerine orange and azalea pink. It’s the shade of budding rose petals, soft candlelight and Himalayan sea salt. Blush, in all its rose quartz glory, is not too sweet, and not too serious. In fact, this taupe-toned pink, part of our new Enchanting Color library, functions like a neutral. Pair it with its bold cousin, fuchsia, or with fellow subtle colors like gray or lilac. It’s the color of evergreen-clad hills shrouded in mist, or a deep clear lake high up in the mountains. Blue Pine is a poignant new hue from Robert Allen’s Enchanting Color collection. Similar to peacock, only darker and with more complexity, this serene hue with modern underpinnings can be used in large swathes to generate a sublime backdrop for vivid colors and earth tones alike. It’s the color of a moonlit sky at dawn, and the last hint of light in the ether long after the sun has set. Twilight, an enigmatic new hue from our Enchanting Color collection, appears gray in some light, and soft blue in others. The result is a restful hue with intrigue that pairs well with a range of colors: crisp whites, brilliant yellows, and dark indigo elements. I hope you found these fabrics as restful, quietly inspiring and enchanting as we have. Questions and pricing? Contact us for easy answers. Enchanted Color fabric collection from Robert Allen. Moody colors and subtle textures. 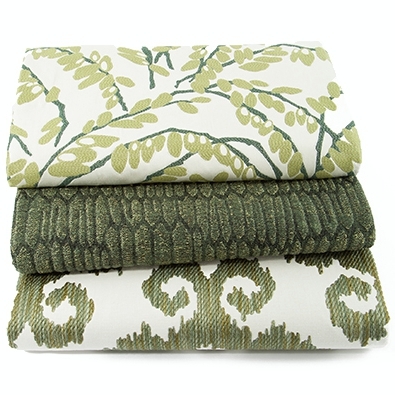 30% off all Robert Allen fabrics for upholstery and cut yardage. A non-technical discussion about upholstery fabric durability. How it is measured. What the ratings mean. And how the ratings translate into everyday terms so you can select an upholstery fabric confident that it will hold up to your needs. Reviving an older furniture upholstery technique to extend a contemporary look when reupholstering traditional furniture. A window treatment project becomes the basis for an exploration of contrasting design elements. Do lines and vines contrast or complement? Or, perhaps both - to everyone's delight! Pictures and very nice fabrics. What fabric can work with tufts? What are channels? A discussion of upholstery buttons, channels and tufts. Lots of photos and some design tips about fabric choices for these upholstery styles. Uncertain about the edge finishing treatment for your furniture? Learn about three of the most common: gimp, nails and welting. When and why are they used? A brief illustration of the difference between 'railroaded' and 'up-the-roll' fabric patterns. With visuals and a short discussion about why they matter for your furniture upholstery project (or not).